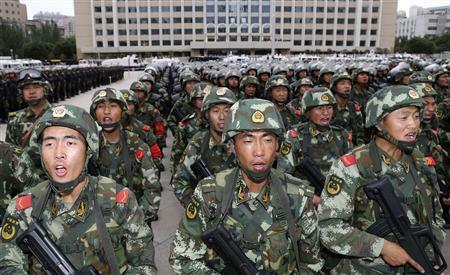 (Photo: REUTERS / STRINGER)Armed paramilitary policemen stand in formation during a gathering to mobilize security operations in Urumqi, Xinjiang Uighur Autonomous Region, June 29, 2013. URUMQI, China, May 1 (Reuters) - Two of the assailants who carried out a bombing in western China were among the three people killed, state media said on Thursday, in an attack which also wounded 79 and has raised concerns over its apparent sophistication and daring. The bombing was possibly timed to coincide with a visit to the region with a large Muslim minority by President Xi Jinping, when security was likely to have been heavy. Pan Zhiping, a retired expert on Central Asia at Xinjiang's Academy of Social Science, described the attack as very well organised, saying it was timed to coincide with Xi's visit. The South Railway Station is where seasonal workers, mainly Han Chinese, arrive from other parts ofChina to pick cotton, Bequelin said. "I just don't believe it was a Uighur who did this," said one 35-year-old Uighur man selling dried fruit about 100 metres from where the blast occurred. "Everyone was running and hiding. I was terrified," said Li Tianlin, a 53-year-old labourer. "We are still afraid and don't dare go over to the train station." Luo Fuyong, a spokesman for the Xinjiang government, denied Raxit's allegations. "This kind of disinformation and slander has no basis," Luo told Reuters by telephone. "This is deliberate hostile rumour-mongering."